Gaming Grounds: Gaming Grounds is Proud to Announce Our Next Tournament - ONE LAST FIGHT! 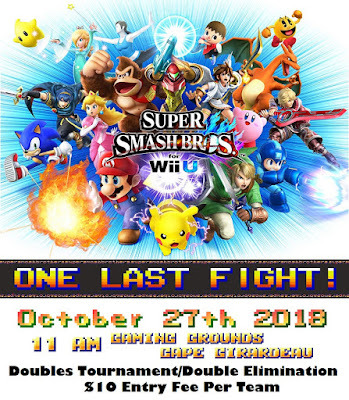 Gaming Grounds is Proud to Announce Our Next Tournament - ONE LAST FIGHT! With Super Smash Ultimate coming out later this year, we decided to have one more fight with our beloved Wii U version. Gaming Grounds will be co-hosting with our friends at Podzilla 1985 to make this our biggest tournament ever. It will be a double elimination doubles tourney, and we're inviting the best of the best to the Cape Girardeau Gaming Grounds to test their mettle. Official rules will be available in our Cape and Jackson stores starting on September 18th, along with sign up sheets. Entry is $10 per team, with prizes for all participants!